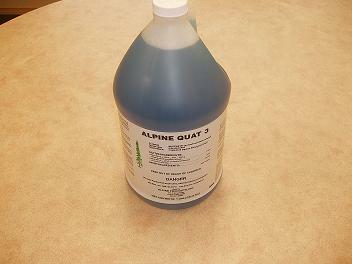 Alpine Quat-3 | Alpine Products, Inc.
Quat-3 Is formulated with power-packed agents combined with a swift, sure-acting germicide. Quat-3 is a skillfully balanced product that contains detergents, detergent builders, wetting agents, water softeners and dual quaternary ammonium disinfectants. It digs out deeply embedded dirt, holds it in suspension, and rinses clean. Quat-3 has a high concentration of ingredients, including a pleasant-smellings odor counteractant and self-identifying blue color. This exceptional product will quickly wet surfaces and penetrate into cracks and crevices, providing the ultimate in cleaning and disinfection. Quat-3 is well suited for all aspects of cleaning and disinfecting, including walls, toilets bowls, sinks, dishes, glassware, eating utensils, food-handling equipment, table tops, telephones. Quat-3 is also an excellent product for floor surfaces, such as sealed wood, linoleum, cement, terrazzo, asphalt, and rubber tile. Food contact surfaces require a potable water rinse. – Eliminates odors – By destroying odor-causing bacteria. Leaves no unpleasant “disinfectant” odor. – Effective – Effective virucidal activity against influenza AZ/Japan, Herpes Simplex l, Advenovirus ll, Vaccinia virus, HIV l, and Hepatitus B. Read instructions carefully for proper cleaning procedures and waste bi-product disposal. – Lavorsaving – Cleans and disinfects in one operation. – Economical – As little as two ounces per gallon of water cleans and disinfects (1 to 64 dilution).